It covers all kinds of interview from recruitment agencies and headhunters to employer and human resources. 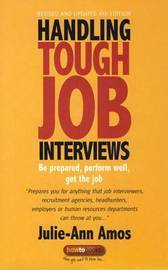 It contains a wealth of sound advice on how to make the right impression, the best questions to ask, how to approach negotiating a salary, taking a psychometric test and how you should treat a regular interview differently from one with a recruitment agency or a head-hunter. It takes you step-by-step though the recruitment process and gives useful advice on interviews with senior management, dealing with psychometric tests; and discussing and agreeing the job offer. JULIE-ANN AMOS is a Human Resources Consultant with considerable experience in recruitment. She is also a member of the Chartered Institute of Personnel and Development. Her books on recruitment have been translated into several languages.